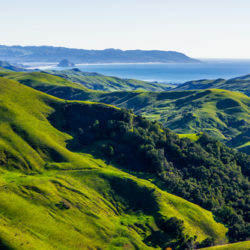 We are pressing forth with our lawsuit seeking an Environmental Impact Report (EIR) to address the significant environmental and human health dangers that will result from continued operation of the Diablo Canyon Nuclear Power Plant near San Luis Obispo. We filed a Reply Brief earlier on February 16th before the Court of Appeals against the California State Lands Commission (SLC) and PG&E, owner/operator of Diablo Canyon. A little background: last year, after the State Lands Commission in June 2016 renewed land leases that will allow Diablo Canyon to continue operating through 2025, we sued the SLC and PG&E. We contend that the SLC did not have the legal authority to exempt Diablo Canyon from environmental review (an EIR) under the California Environmental Quality Act (CEQA), and that its action in doing so was arbitrary, capricious and endangers California’s environmental protection laws. That there has never been a environmental impact report for Diablo Canyon is a simply unacceptable. Studies by the U.S. Nuclear Regulatory Commission show that Diablo Canyon is the third most “embrittled” nuclear plant in America, which could result in a massive release of radiation in a Fukushima scenario involving an earthquake and/or tsunami. Scientific reports and peer-reviewed studies also cited in the lawsuit show increasing rates of cancer and infant mortality in San Luis Obispo communities located adjacent to and downwind from the plant. Simply put, the residents of San Luis Obispo deserve the right to know the potential health and environmental risks of the power plant. When our lawsuit went to trial in July 2017 before Judge Mary H. Strobel, she ruled against us with a pre-printed opinion she handed out just before the case was argued in a non-jury hearing in Los Angeles Superior Court. Despite the initial loss, we have not given up the fight. In our latest court filing, we are asking the Court of Appeals to compel the SLC to set aside its previous decision approving new tidewater leases for PG&E and to require compliance with CEQA, including a study to determine if the plant needs further environmental review before a new lease is granted. If nothing is done, and Diablo Canyon continues to operate unchecked, there is a potential for substantial harm to befall the adjacent communities and marine ecosystem during the nine-year interval leading up to the plant’s proposed closure in 2025. We believe that the Appellate Court should overturn its decision and require the Commission to comply with CEQA requirements, including preparation of an initial study to determine whether an EIR is required. We remain committed to continue the fight against this imminent danger to our state, its environment and its people. If no one else will stand up against a dangerous, aging nuclear plant in our backyard, we will. Want to read the reply brief? You can find all of our legal filings on our website.